Every time I go out in the street in my adopted continent, I see something that, by the central European standards I grew up with, is outrageous, logic defying, irresponsible, shocking or at the very least unusual. Sometimes it is terrible, at other times beautiful. Sometimes it is trivial,sometimes sublime, at other times absolutely appalling, debasing. Often it is defining of an entire culture, country or society. Never ever is it boring. I am not trying to romanticize this kaleidoscope of life energy too much. No, the phenomenon of things not being predictable does not make Asia better than Europe. Chaos does not always offer more freedom. And freedom does not always appear as a result from a lack of order. But it sure is entertaining out here, because freakishness is part of the picture and does not linger on the margins, the way it so often does where I come from. Freakishness in Asia is often mundane, because only in mundanity can otherness truly flower without risking to offend the status quo. And we all know that offending the status quo is always fraught with huge risk, no matter where one might be doing it. 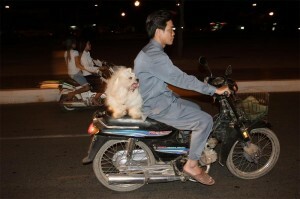 Here is a sweet moment from Phnom Penh, Cambodia at night, at a wild guess around 2003.